Here's Medusa's Child, a German metal band that's been flying under the radar for several years. They return with their fourth studio album, Empty Sky, now on the Pure Steel Publishing label. Medusa's Child: it's sunny in the mountains. Medusa's Child is basically channeling classic melodic heavy and power metal akin to the NWoBHM metal and it's counterparts around the world. Their sound is rather straight forward. Founder and vocalist Crow has a strong, clean voice, and can often soar. They appear to add a twin lead guitar assault, offering more traditional metal solos, not so much on the neo-classical side, though you might hear it. The guitar solos are one of the great strengths of the band. The rhythm section is sturdy, easily handling the mixture of tempos throughout this album. Within many songs, like Slave of Memory or Paradise Eternally, the pace can sway between moderate to speedy. While the band handles their chosen genre with skill, mention should be made of several songs. One is Beethoven's Kiss, which has sweet and impressive drum line. Another is My Inner Voice, a metal anthem with Crow offering a passionate performance over a lush arrangement. A sweet, nearly subdued, guitar solo comes later in the song. As a bonus track you get the song in an acoustic form. Finally, and probably my favorite track, there's Remember You, with another mixture of tempos, yet more groove, rippin' solos, and a darn fine and catchy refrain. If you like classic heavy metal in the vain of anything from Iron Maiden to early Stratovarius, you'll enjoy Medusa's Child's Empty Sky, and you get more than an hour of metal to boot. It's all good. Recommended. 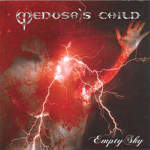 If you like classic heavy metal in the vain of anything from Iron Maiden to early Stratovarius, you'll enjoy Medusa's Child's Empty Sky, and you get more than an hour of metal to boot. It's all good.